Live TV, streaming and a Voice Remote that finds shows fast. All in one place. All the action. All on Contour TV. Stream your favorite shows anytime, anywhere. Live TV, sports, On Demand™ and all your favorite shows. 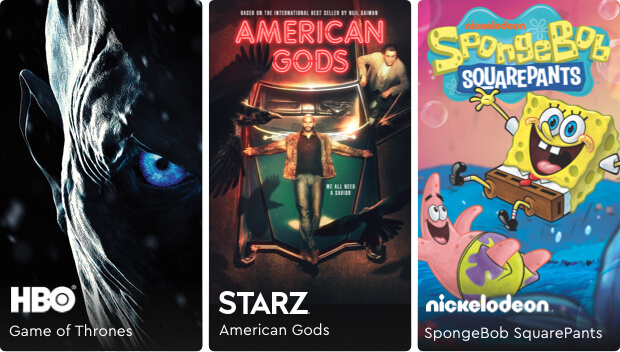 Bring all your shows and apps together, with TV and Internet bundles. Just speak into the Voice Remote to search all apps, live TV, On Demand, DVR recordings and more. Use the Contour app and network apps to take TV on the go, even before your installation date. Simply download the app(s) to your mobile device or watch online on your computer. Catch every hit of the season while checking live scores and stats on the Contour Sports App. Or watch on the go on the Contour App. To check, we compared Contour to some other types of TV. 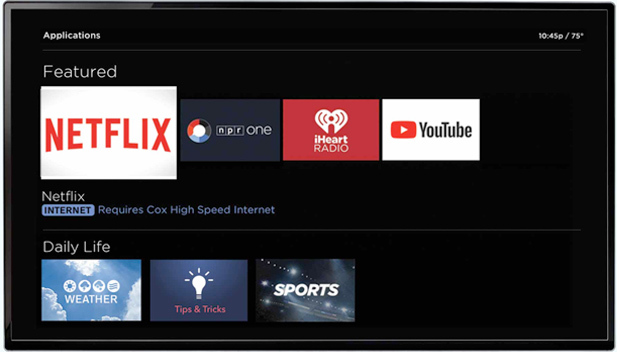 Learn how to set up your Cox TV service to get the most out of the best TV plan for you. What are the differences between Contour TV and TV Starter? Contour TV gives you our best HD TV experience with the latest features and our expanded basic cable lineup with the ability to add channel paks to suit your entertainment needs. TV Starter includes our limited basic cable lineup (local broadcast, government, and education channels, plus shopping favorites) with limited features. Both are cost-effective plans that include online and mobile streaming. What TV plan is considered "basic cable"? If you want to watch all your basic cable channels on your television, Contour TV is the cable package for you. Contour TV starts with a great channel lineup including local broadcast channels, ESPN, Disney, Discovery, History, A&E, TNT, HGTV & more, plus gives you the flexibility to pick and choose any additional channel paks you may want to add to your cable service the future. It's the best of both worlds -- get your basic cable channels, with room to grow. How can I see my TV channel lineup? Your Cox TV Channel lineup is available online here or on our Contour TV app for Android and Apple devices. Can I customize what channels are included in my Cox TV plan? Yes, with Contour TV you can add your favorite premium channels (HBO, STARZ, Cinemax, SHOWTIME) and channel paks including sports, movie, entertainment, news and Latino channels. TV Starter only supports a limited basic cable lineup, so additional channels cannot be added. How can I watch TV online or on my mobile device? Streaming TV is available for most of your channels and favorite TV shows inside and outside of your home when you use the Contour app and have an Internet connection. Learn more about the Contour app, including how to download the mobile app and watch TV using your web browser, here. Plus, enjoy free access to TV Everywhere network apps for channels you subscribe to. How can I purchase digital receivers? Cox does not sell digital receivers. If you already own a digital TV receiver, we lease CableCARDs that work with certified compatible CableCard retail devices, like TiVo. It's the perfect solution to provide you with the cable TV experience you are looking for without the added charges of renting equipment you've already invested in. Does On Demand use data towards my monthly internet data limit? What features come with the new bundled Contour TV experience? By bundling your Contour TV with Internet Preferred 100 or higher, you unlock great features. With an innovative on-screen guide, Smart Search, voice remote control, up to 1,000 hours of DVR storage and much more, the new Contour is a TV service to experience – not just watch. Find your favorite shows and channels quickly by speaking into your remote control. Plus, with our unparalleled high-speed Internet, it's a bundle package you don't want to miss out on. Learn more by exploring the Cox Contour experience. Can I use TiVo with Contour TV? Yes! If you already own a digital receiver, we lease CableCARDs that work with certified compatible CableCard retail devices, like TiVo. It's the perfect solution to provide you with the cable experience you are looking for without the added charges of renting equipment you've already invested in. How do I schedule recordings for my DVR though the website? You can schedule recordings online by visiting your TV Listings page here. How do I check what time my TV show is on? You can check show times online by visiting your TV Listings page here. How does instant TV access work? Instant TV access allows you to stream all your out of home TV channels and shows ahead of your scheduled installation date. After your order is complete, simply register for your Cox My Account and download the Contour TV App from the Google Play Store or Apple App Store to your devices. Use your account to stream great entertainment while you wait. In addition to the Contour TV App, you also have the option of Watching TV Online or watching TV via the many TV Network Apps available in your channel lineup. How much is Contour cable & streaming TV per month? Contour TV prices start as low as $69.99 per month for 12 months . Streaming on your mobile devices and computer is included for free. After choosing an offer, you’ll have the option to configure your TV equipment, DVR service and channel paks. Visit the Bundles & Deals page to shop all TV offers. Offers expire 07/01/19 and are available to residential customers in Cox service areas. Prices exclude taxes, surcharges and other fees. Other conditions apply. Additional bundle options are available and may be required to receive all advertised features. Early termination fees may apply. Prices exclude installation/activation fees, equipment charges, inside wiring fees, additional outlets, taxes, surcharges (including an additional $7.50/mo. Broadcast Surcharge and a Regional Sports Surcharge $2.60-$8.00/mo. depending on Cox market) and other fees. Not all services and features available everywhere. A credit check and/or deposit may be required. Offer may not be combined with other offers, discounts or promotions. Online orders only. Other restrictions may apply. See Contour TV service details. Netflix streaming subscription required. HBO® and related channels and service marks are the property of Home Box Office, Inc. HBO subscription required. Starz® and related channels and service marks are the property of Starz Entertainment, LLC. Visit starz.com for airdates/times. American Gods© 2018 FremantleMedia North America. All Rights Reserved. © 2019 Viacom International Inc. All rights reserved. Nickelodeon, SpongeBob SquarePants, and all related titles, logos and characters are trademarks of Viacom International Inc. Created by Stephen Hillenburg. See important information in the Residential Customer Service Agreement for full coverage details. See Annual Notice information for related information and your privacy rights as a Cox customer. For all Cox Communication policies regarding our services and business practices visit www.cox.com/aboutus/policies.html. Contour is available to residential customers with Cox Contour TV Preferred or higher TV service. Digital receiver/remote and Cox approved modem required. The Contour TV Package includes the Contour guide with personal show recommendations, access to over a dozen additional HD channels, and optional Record 6 DVR service, which allows you to record 6 shows at once and watch all your recorded shows on any TV in the house. Record 6 DVR service fees are in addition to Contour service and Record 6 DVR receiver charges. Receivers to view programming in additional rooms are extra. Storage claim based on 1,000 hours of SD programming; capacity varies with mix of HD and SD recordings. The Contour app is available to customers with any Cox TV service. The app is compatible with iPad 2 or newer (iPad 1 is compatible with the Cox TV Connect app, also found in the App store). Personal show recommendations based on TV viewing and the Watch On TV app feature requires the Contour TV package. iPad is a trademark of Apple Inc., registered in the U.S. and other countries. Blackout restrictions apply to sports programming. Sports package subscriptions automatically continue from year to year at a special renewal rate, unless the auto-renewal option is not accepted at the time of purchase, or the package is cancelled before the start of the next season. NHL, the NHL Shield and Center Ice are registered trademarks and The Game Lives Where You Do and the Center Ice logo are trademarks of the National Hockey League. NHL and NHL team marks are the property of the NHL and its teams. The NBA logo and team identifications are the exclusive intellectual property of the NBA Properties, Inc. and the respective member teams. Major League Baseball trademarks and copyrights are used with permission of Major League Baseball Properties, Inc. League Pass, Extra Innings, MLS Direct Kick and iN DEMAND are services and marks of iN DEMAND L.L.C. ESPN, ESPN Full Court and ESPN Game Plan are service marks or trademarks of ESPN. NFL RedZone and other NFL-related trademarks are trademarks of the National Football League.